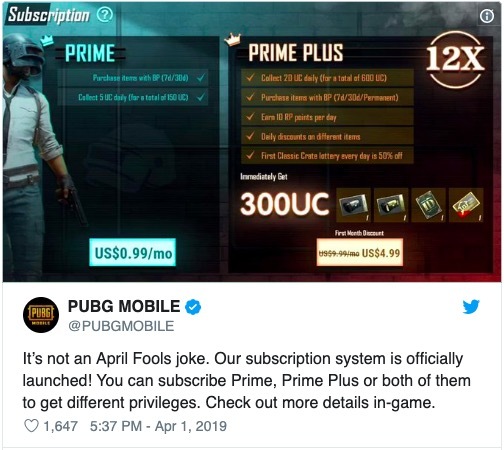 Tencent Games, maker of popular PUBG, has launched PUBG Prime and PUBG Prime Pls subscription plus for Android and iOS gamers. Initially, users thought it an April Fool’s day joke. Later, the company tweeted to clarify that the announcement wasn’t a joke. Prime subscribers can purchase in-game items with the battle points for a period of 7 days or 30 days. They will also get 5 unknown cash every day for 30 days and up to 150 UC. Prime Plus subscribers will get 20 UC each day up to 600 UC. They can also purchase items with BP for a period of 7 days or 30 days or permanent They will also get 10 RP points per day and daily discounts on different items. Prime Plus subscribers will also get 300 UC along with four in-game items immediately. PUBG Prime costs Rs. 79 on iOS and Rs. 85 on Android. The Prime Plus plan is priced at Rs. 799 for iOS and Rs. 850 for Android, but gamers can get it for Rs. 419 on iOS and at Rs 400 on Android for the first month. It can be seen that subscription prices are not the same for Android and iOS. 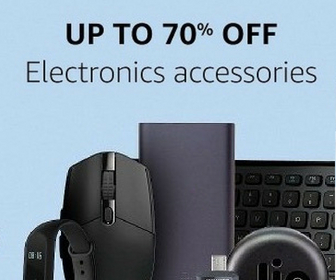 The company has also not given any statement about the price difference. We will update when there is anything from the company about these plans and price difference. Will you buy the new subscription plans for PUBG? Let us know in comments.